Hereditary angioedema III (HAEIII) is a life-threatening disorder that is characterized by episodic swelling of the face, extremities, upper-respiratory tract, and gastrointestinal tract. HAEIII pathology is linked to dysfunction of the kallikrein-kinin pathway, which results in vascular leakage due to accumulation of the proinflammatory peptide hormone bradykinin. The zymogen factor XII (FXII) is activated by negatively charged substrates, and the active form promotes bradykinin formation. Point mutations in the gene encoding FXII are associated with HAEIII; however, it is not clear how the mutant protein contributes to HAEIII pathology. Jenny Björkqvist and colleagues at Karolinska Institute determined that HAEIII-specific mutations (T309K and T309R) result in a loss of O-linked glycosylation in the proline-rich domain of FXII. In isolated plasma, FXII proteins lacking this O-linked glycosylation exhibited increased substrate-mediated activation, leading to increased bradykinin formation. Furthermore, compared to control animals, mice expressing human HAEIII-associated FXII mutants exhibited excessive substrate-induced vascular leakage. Importantly, substrate-induced vascular leakage in FXII mutant-expressing mice was blocked by pharmacological inhibition of the kallikrein-kinin pathway and by administration of an FXII-neutralizing antibody. Together, these data point to a central role for FXII-dependent activation of the kallikrein-kinin pathway in the etiology of HAEIII and suggest that anti-FXII antibodies have potential as a selective therapeutic strategy for treating HAEIII. 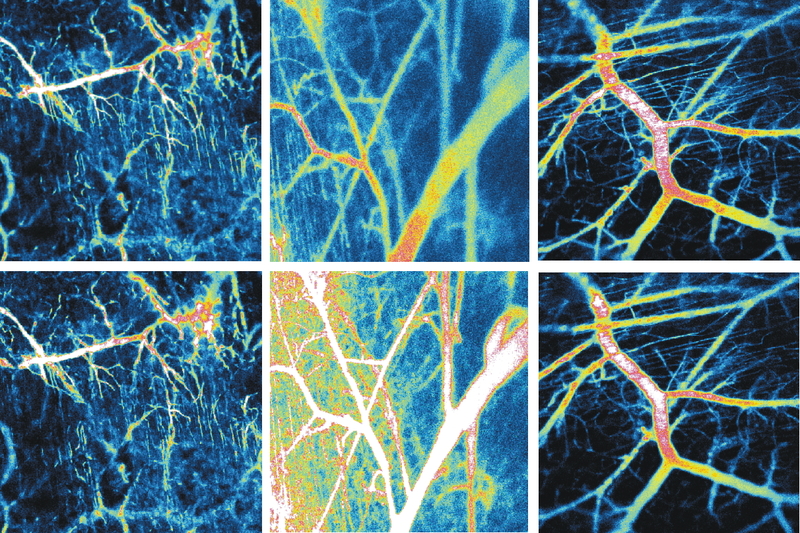 The accompanying image shows laser scanning micrographs of skin microvascular fluid (FITC-dextran tracer) in control mice (left), HAEIII-associated FXII-expressing mice (center) and HAEIII-associated FXII-expressing mice pre-treated with an anti-FXII antibody (right) prior to (top row) and 10 minutes after (bottom row) substrate-mediated activation. Note the dramatic increase in vascular leakage in FXII-expressing mice following substrate-induced activation. Citation Information: J Clin Invest. 2015;125(8):3132-3146. https://doi.org/10.1172/JCI77139. Hereditary angioedema type III (HAEIII) is a rare inherited swelling disorder that is associated with point mutations in the gene encoding the plasma protease factor XII (FXII). Here, we demonstrate that HAEIII-associated mutant FXII, derived either from HAEIII patients or recombinantly produced, is defective in mucin-type Thr309-linked glycosylation. Loss of glycosylation led to increased contact-mediated autoactivation of zymogen FXII, resulting in excessive activation of the bradykinin-forming kallikrein-kinin pathway. In contrast, both FXII-driven coagulation and the ability of C1-esterase inhibitor to bind and inhibit activated FXII were not affected by the mutation. Intravital laser-scanning microscopy revealed that, compared with control animals, both F12–/– mice reconstituted with recombinant mutant forms of FXII and humanized HAEIII mouse models with inducible liver-specific expression of Thr309Lys-mutated FXII exhibited increased contact-driven microvascular leakage. An FXII-neutralizing antibody abolished bradykinin generation in HAEIII patient plasma and blunted edema in HAEIII mice. Together, the results of this study characterize the mechanism of HAEIII and establish FXII inhibition as a potential therapeutic strategy to interfere with excessive vascular leakage in HAEIII and potentially alleviate edema due to other causes.